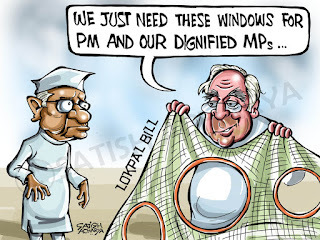 India Against Corruption - What is Jan Lokpal Bill? Who is Anna Hazare? I am writing this on 17th of August, 2011 when Anna Hazare is fighting in Thihar Jail for the right to protest. The government is claiming that it's not Anna Hazare who makes the law, but its the government, elected by the public, makes the law. In last few years the public is seeing many ministers elected by them going to jail for corruption, and the same public is coming out from their houses to support Anna Hazare, who is fighting against corruption. 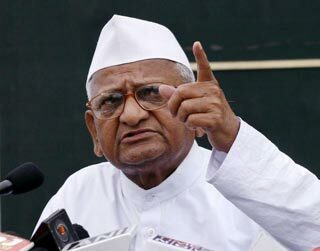 Anna Hazare, a Gandhian born on 15 June 1937 in Bhaaingar, a small village in Maharashtra. He won the Padma Bhushan from the government of India in 1992 for development and structuring of Ralegan Siddhi, a village in Maharashtra and his efforts for establishing it as a model village. "The Jan Lokpal Bill also called as Citizen's ombudsman Bill is a draft anti-corruption bill drawn up by prominent civil society activists seeking the appointment of a Jan Lokpal, an independent body that would investigate corruption cases, complete the investigation within a year and envisages trial in the case getting over in the next one year." This bill was first introduced by Shanti Bhushan in 1968 but could not pass through Rajya Sabha. This again got introduced many times but failed to come out as a law. Early this year Anna Hazare started a Sathyagraha at Delhi demanding the pass of the bill and got attention of the media as well as the public. A voluntary organization named India Against Corruption (IAC)was formed and a draft bill is formed by Justice Santosh Hegde, former Supreme Court Judge and former Lokayukta of Karnataka, Prashant Bhushan,Supreme Court Lawyer and Arvind Kejriwal an RTI activist. Now the question is why we need a LokPal bill which does not have any power to take action against the political leaders? Government want the investigation to be done by the CBI which is directly controlled by the prime minister. Even a common man understand the outcome of an investigation by CBI against the PM! Again what people are asking is why Congress party is so much worried about bringing PM under LokPal! What's there in the Jan Lokpal for the common man? It's a bill by the common man for the common man, if any work requested by a citizen is not done in a pre-defined time in any government office, Lokpal will put a penalty on the guilty officers, which will be given as compensation to the complainant. Some debates are going on in Lok Sabha and Rajya Sabha between the ruling members and the opposition, as usual. It's clear that the common people want the Jan Lokpal to be implemented, but politicians need some protection from the Law. Why? All knows why! Let us wait and watch what happens next! Visit India Against Corruption for more details. Update: Finally the Government agreed to have talks on the Jan Lokpal Bill and Anna Hazare ended his 288 hours long fast on August 27th. We need the law to tighten its punishment on the corrupt bureaucracy,The lokpal will bo no good to put an end for corruption,another set of people will sit in lokpal to do more corruption.Anna is just gaining publicity for himself nothing more.